The Trump administration’s meltdown proves it. 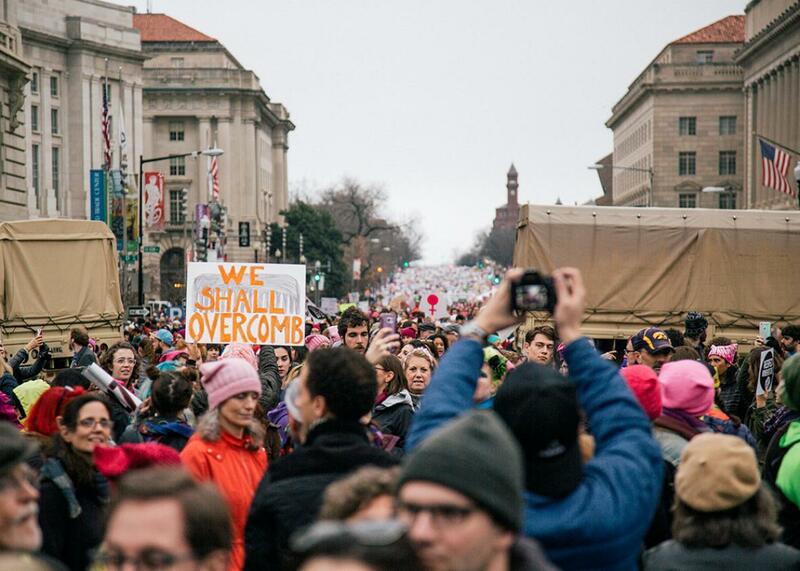 Demonstrators were visible as far as the eye could see down Pennsylvania Avenue and 14th Street during the Women’s March on Saturday in Washington, D.C.
As a candidate, Donald Trump seemed untouchable. His Republican rivals struggled to break his hold on large parts of the GOP base, and Hillary Clinton failed to disqualify him as a potential president despite constant attacks on his prejudice and temperament. “Teflon Don,” some took to calling him. The man seemed immune to attack from political rivals. But that was never quite true. Trump was harmed by those attacks. He finished the year as the most unpopular nominee in modern memory, and he now stands as the most unpopular new president in the history of modern polling. The difference is that, during the election, Trump had a shield of sorts. He was an outsider. Millions of voters would forgive his flaws and foibles because he promised to shake things up. In some ways, the grotesqueries of his persona, rather than anathematizing him to voters, only enhanced his appeal among those wishing for something different. And by November, a critical set of voters were ready to elect him for the simple fact that he wasn’t Clinton. At the same time, he was still Donald Trump: still impatient, impulsive, dishonest, and deeply narcissistic. And now Trump is an actual president with real responsibilities. He has to stand on his own against a largely unified opposition, a critical press, and an unforgiving public. If the first few days of his presidency are any indication, that’s just too much. Faced with a lackluster inauguration and mass protests, President Trump had a bona fide meltdown and drove his staff to make serious errors, immediately undermining his administration. This isn’t just cause for schadenfreude; it is an important revelation: constant, high-profile criticism works. Protest works. Trump turned on the television to see a jarring juxtaposition—massive demonstrations around the globe protesting his day-old presidency and footage of the sparser crowd at his inauguration, with large patches of white empty space on the Mall. As his press secretary, Sean Spicer, was still unpacking boxes in his spacious new West Wing office, Trump grew increasingly and visibly enraged. This was hugely misleading, if not an outright lie, and the press immediately pounced on it, criticizing the White House for its dishonesty. But Trump’s aides doubled down on the claim. In an interview on Meet the Press, Kellyanne Conway said that Spicer had delivered “alternative facts” rather than a falsehood. And on Monday, after promising honesty to the press corps, Spicer asserted—again—that Trump had captured a historic audience for his inauguration. Any other White House would have brushed off its lackluster crowds. For the Trump White House, it has become a days-long ordeal, consuming its oxygen and erasing any goodwill it might have held with a press in beat-sweetening mode. And it will likely continue, albeit in different form. On Tuesday, during an afternoon news conference, Spicer defended the president’s false belief that the 2016 election was marred by millions of fraudulent votes. “He continues to maintain that belief based on studies and evidence people have presented to him,” said the press secretary. Again, this isn’t true. And given his careful wording, focused on Trump’s belief and not the facts of the matter, it’s almost certain Spicer knows it isn’t true. He is misleading the press, giving fresh fuel to media frustration with Saturday’s performance. We can thank the spectacle of the Women’s March on Washington for all of this. It put Trump, who craves adulation, on the defensive, and it’s produced a scandal that does nothing but hamper the White House as it struggles to build credibility with the public. There are a few lessons here. First, activists should know that their protests work. And that the larger the gathering, the greater the odds that Trump will respond with crippling anger and outrage. Second, Democrats on the Hill should see that Trump is far weaker than he looks. Popular presidents don’t lash out against protests. But then, most presidents don’t enter office with his unfavorability ratings already in the low to mid 50s, and most presidents aren’t immediately met by mass demonstrations. At present, all but a handful of Senate Democrats are playing nice with Trump’s Cabinet nominees. Perhaps they should take a page from the marchers. Resistance—on the basis of clear deficiencies such as Ben Carson’s complete ignorance of the Housing and Urban Development agency, of which he will soon be in charge—helps their cause by building political energy for further action. Accommodation only threatens to weaken enthusiasm on the ground. Actively opposing Trump’s nominees also denies the patina of bipartisanship that could help the president, and the Republican majority, build ground with the public. Donald Trump is not immune to attack. He isn’t actually Teflon Don. He is a novice, an unpopular executive with a deep need for public affirmation. That final fact is his chief weakness—the thermal exhaust port of this unified Republican government. For opponents of Trump, now is the time to exploit it.